The album's artwork, with its photos of vintage oscillographs and other old electricity-related gadgets, is an important key in understanding the direction the Jazz Bigband Graz are heading toward: a combination of new and old, using electric sounds but creating something that never tries to be trendy. Similarly, the group has dropped its full name and substituted it with the acronym JBBG to underscore the fact that, while there is a large ensemble with a full horn section at work, the results have little to do with what is usually associated with big-band music. 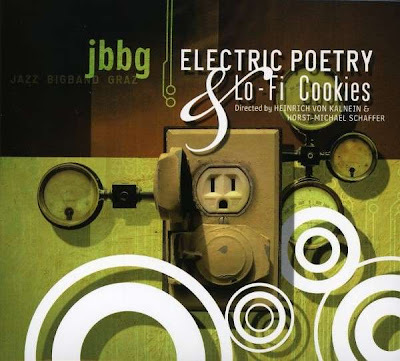 ELECTRIC POETRY & LO-FI COOKIES uses both acoustic instruments and electronic devices, and the album boldly goes into a musical territory where mellow big-band orchestration meets an electronica sound that brings to mind, say, Pete Namlook's ambient click-hop recordings. The band employs a theremin, an electric trumpet, spoken word parts, sung vocals, a harmonica, and all kinds of distortion and sound alteration tricks. And while all of this sounds like an eclectic anything-goes recording on paper, there is an impressive coherence to the music: actually, there is such a controlled feeling to the proceedings that, at times, you wish the band would just let loose and ignore its corset more often. The band is directed by two people: Heinrich von Kalnein and Horst-Michael Schaffer, and it's difficult to say who's responsible for what, even though Schaffer seems to be the driving force behind the group's modern musical direction, writing all five compositions on the album; contributing vocals, trumpet, and programming; and being lauded in the album's liner notes for his musical skills. The resulting album is one of the most forward-thinking enterprises in recent jazz, even though it is more likely to be enjoyed by electronica and ambient fans than by aficionados of traditional big-band music. This review was written for the All-Music Guide on May 3, 2008.